This screen can be reached from the Template Menu, or by opening a template file. The Template Load screen allows you to assign Input Files for up to eight input items in a QuickPIP template. When the template is applied to the project, its Display Objects will then use the Input Files that you had selected here. 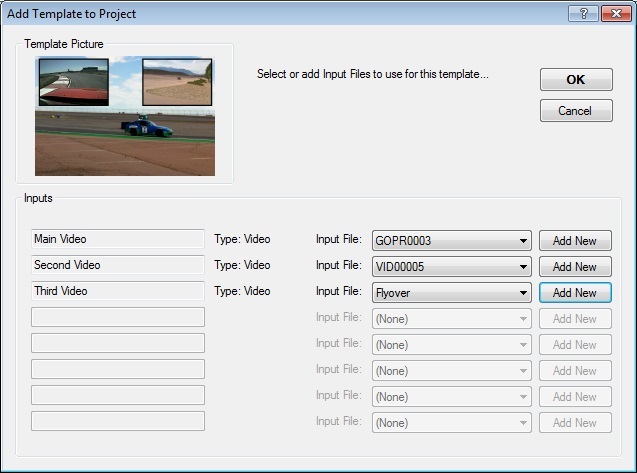 "Input File" selections - Select the Input File in the current project to associate with this template input item. "Add New" buttons - Opens an Input File on your system, adds it to the project, and assigns it to the related template input item. "OK" button - Applies this template configuration to the project. "Cancel" button - Cancels import of this template.